An evaporator is where the magic of refrigeration takes place, this is where the heat transfer happens. A few considerations are: do you want a freezer compartment or not? How big is the icebox? Where can I mount the evaporator? 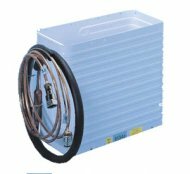 Bin-style evaporators make a freezer compartment inside - these are the most popular type of evaporator. 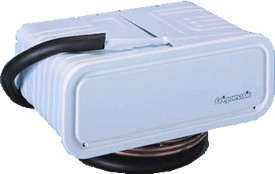 Flat evaporators can be bent once or twice to fit into an icebox. We use flat evaporators for freezers, spill-over systems (freezer on one side, fridge the other of an insulated divider) and for smaller iceboxes to minimize the space. Please note: do not use metal tools when defrosting a fridge system! Door kit for Frigoboat 130H evaporator. Thermoformed plastic with bungee cord. Dimensions: 10" x 3"
Door kit for Frigoboat 340B evaporator. Thermoformed plastic with bungee cord. Dimensions: 13" x 6 1/4"